STEP 1 Locate your meter box, generally found towards the front of a property, near the road. The box is typically in a direct line with the main outside faucet. It is housed in a plastic box with a blue removable lid. Remove the lid by placing a finger in the hole already existing in the lid and lift lid upwards. Please be careful as wasps, spiders, and snakes have been known to be in a meter box. STEP 2 Once you open the meter box lid, lift the protective cap on the meter. On the face of the meter, there is a large dial and a display of numbers. For the residential meter, each rotation of the dial measures 10 gallons. Read the number display from left to right. Be sure to include the stationary zero. This is your meter reading. 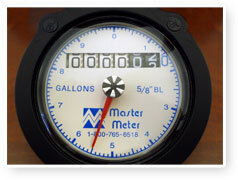 Meters measure water in gallons or cubic feet. Charges for the amount of water consumed are rounded to the nearest hundred gallons or ten cubic feet used during a billing period. Compare that reading to what your bill states as your current or present reading. Step 4 Please do not use Sand Flat Water Supply's shut off valve to turn your meter off. We ask that each customer install their own shut off valve on the customer side of the meter.